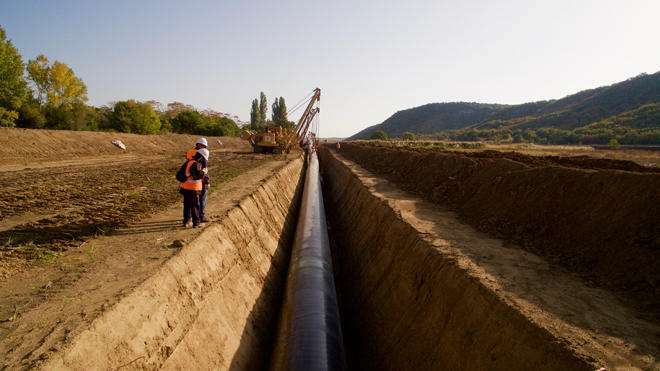 More than 90 percent of construction work has been completed on the Albanian section of the Trans Adriatic Pipeline (TAP), which envisages transportation of Azerbaijani gas to Europe, Albanian Ministry of Infrastructure and Energy told reporters. Albania estimates that the overall progress in TAP’s implementation in the country has been in line with the forecast, according to the ministry. "Since September 2016, when the TAP project has gone to the pipeline construction phase in its onshore section, by the end of 2018, over 90 percent of the pipeline construction has been completed on this section," said Albanian energy ministry. The work on TAP’s offshore section on Albanian territory started in October 2018, said the ministry. Albanian energy ministry said that during 2019 it is expected that the construction of TAP will be completed. Moreover, TAP progress in 2019 will include issuing the relevant permits for the certification of the respective sections of the TAP project in the Albanian territory, the relevant approvals from the ERE for the licensing of TAP AG as a gas transmission operator, according to the ministry.